Later in the show, perhaps realizing that accidentally declaring someone dead on-air isn’t great, co-host Steve Doocy issued an apology. “A technical error in the control room triggered a graphic of Ruth Bader Ginsburg with a date on it,” he said. “We don’t want to make it seem anything other than that was a mistake. It was an accident.” In a statement to Deadline, a Fox News spokesperson confirmed it was an error by the graphics team. Fox & Friends aired a graphic that showed Ruth Bader Ginsberg had passed away. 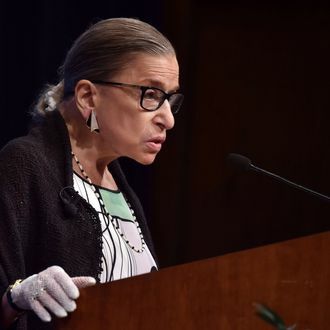 In 1993, Ginsburg became the second woman appointed to the United States Supreme Court, and she’s recently morphed into a gavel-wielding, pop-culture phenomenon. Her trials in life and the courtroom have been the subject of a certifiably fresh documentary, and a biopic in which her real-life husband, Marty Ginsburg, was played by a not-angry Armie Hammer. She’ll also make a cameo, at least as a mini-figurine, in The Lego Movie 2: The Second Part. Final verdict: RBG just keeps winning.